This Saturday, October 12, 2013 from 12-5pm, Cristina Hurley Gallery will continue its "Meet the Artist" series with Fiber artist Diane Ivey! Diane spins and dyes her own yarns, and is an experienced knitter as well. 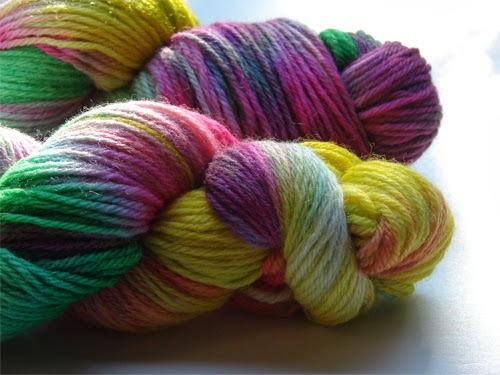 She makes beautiful, colorful skeins of yarn that will make any project, even the simplest, burst with color! Come meet this talented artist and get to know her work, ask her questions about her process, and enjoy good company surrounded by beautiful fine craft! Lady Dye Fiber Arts & Design, LLC, an eco-friendly street-art inspired yarn business. "My yarn has a strong message to a growing population of people living in metropolitan areas that knit, crochet, create graffiti art and are graffiti knitters." As a brand, Lady Dye is continuing to establish a presence in the street art culture in Boston. Diane holds a Bachelor of Arts in Political Science and Mass Communication with a concentration in Print Journalism. She also holds a Masters in Public Administration with a concentration in Non-Profit Management from Suffolk University. As a member of Boston Handmade, Diane spends time promoting her work at various art venues and teaches fiber arts classes at the Eliot School of Fine & Applied Arts, JP Knit & Stitch in Jamaica Plain, and elsewhere. A knitter for the last ten years, and a dyer, spinner and crocheter for six years, Diane looks forward to expanding her business. Hope to see you there! Free event, refreshments will be served.